Just to get the seasons right. Snow is falling..., originally uploaded by Tomaz Celestina. The vortex of Life has taken me away from LJife for the past few days, but I just wanted to let you know I live in a totally proper season and weather. 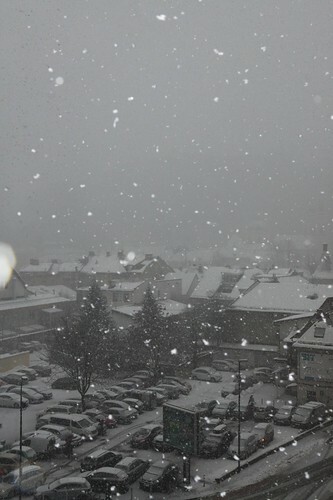 Ljubljana is under heavy snow fall. We're supposed to get extra 20cm/8in of snow till tomorrow. YAY YAY YAY! So I can't see the castle and I used the flash to get that extra "snow is falling, gently falling" sensation. LJife will happen sometimes tonight! Happy weekend! We had a total media sensation with predictions of snow here in the southeastern US. Then... nothing. Just a little chilly drizzle. no snow in my city but we are just above 0ºC right now. can I have a hug? this has got to be the most magical image of a parking lot I've ever seen. Sorry to hear the Wintry Queen has robbed you of the vision of your castle. It is... And winter is such beautiful time of the year. It's the perfect pix that begs for this song which was my favorite growing up, because, well, I'm just that kind of queen. Duh. So now, I balance it out with this song... so it's warmer. And less depressing :-.D (disregard the graphics) Sometimes to no avail. Look for my mails. I need to know those things. Hvala. I will tell you all you need to know. The weather is unseasonably warm here, and I hate it. Yes, snow here is sooooo pretty. it's just not as fun when it's been here for a while!